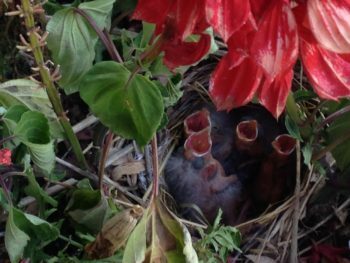 In last week’s blog post, I told you about the bird’s nest I found hidden in the flower pot right outside my front door. Well, this week I’m thrilled to announce that the babies have arrived! Suddenly, six hungry mouths opened wide. It was absolutely hysterical!!! It truly amazed me – how did this little bird know how to build this nest, and more importantly, find a safe place to hide it? How did she learn to protect her babies? Instinct – that’s all I could think of. And you know what? We have that same instinct inside of us. It’s that feeling we get in the pit of our stomach, telling us that something isn’t quite right. The trick is to listen to it. Sure, you can come up with lots of excuses to ignore it. But I’m guessing, just like that little bird knows how to protect her babies, you also know how to protect yourself. You know what’s best for your own survival. Pay attention to that feeling in your gut, listen to that inner voice. It may know you better than you know yourself.